The Correspondence of William Henry Fox Talbot Project has prepared a comprehensive edition of the nearly 10,000 letters to and from Talbot (1800-1877), the Wiltshire polymath best known for his invention of photography. Draft transcriptions of nearly all the letters were posted by September 2003 and these are now being further annotated and edited. The conception and editorial foundations of the project took place at the University of Glasgow between 1999 and 2004. Additional development and hosting is now undertaken by Knowledge Media Design, De Montfort University. The Correspondence editor is Professor Larry Schaaf. At the age of eight, Henry Talbot commanded his stepfather to 'tell Mamma & everybody I write to to keep my letters & not burn them' (Document Number 00492). This precocious awareness of the value of his letters, combined with the protection of a stable family structure through several generations, has led to an unusually complete archive. Talbot is best known as the scientist and artist whose role was critical to the invention of the art of photography. In addition, he made significant contributions to fields as diverse as Assyriology, astronomy, botany, electricity, etymology, mathematics, optics and politics. As a scientist, Talbot blended 18th century traditions of the amateur with 19th century concepts of progress and professionalisation. He was a Fellow of the Astronomical, Linnaean, and Royal societies; the latter gave him two gold medals, one for the invention of photography and one for mathematics. Talbot came from a family with strong diplomatic, social and royal connections and sat briefly as a Whig (reform) Member of Parliament. He sensitively guided his estate of Lacock Abbey in Wiltshire through the perils of the social uprisings in the 1830s and the expansion of the railways in the 1840s. Talbot published eight books and more than a hundred journal articles and was granted twelve patents. He was awarded an honorary Doctorate from Edinburgh University. Although personally shy, Henry Talbot was a brilliant figure who lived within a sphere of substantial influence. When he was young, his family lived extensively on the continent, fostering a lifelong interest in travel and providing lasting contacts outside Britain. His mother, Lady Elisabeth Feilding, was an outspoken daughter of the 2nd Earl of Ilchester. Her social connections and ambitions for her son provided the greatest impetus for his public endeavours. Talbot's uncle, William Thomas Horner Fox Strangways, a botanist and career diplomat, helped Talbot gain influence outside Britain. One half-sister, Caroline Mount Edgcumbe, was a Lady-in-Waiting to the Queen. A favourite and close cousin was Christopher Rice Mansel Talbot, the Welsh industrialist aptly described in his day as 'the wealthiest commoner' in all of Great Britain. The day-to-day life of Henry Talbot provides a rich picture of the process of invention and of the society in which the inventor lived. Talbot's correspondents were a diverse lot. Counted amongst his closest scientific associates were Sir John Herschel, an astronomer and ingenious inventor of photography, and Sir David Brewster, the controversial and highly influential Scottish physicist and scientific journalist. Thomas Moore, the wildly popular Irish poet, was a neighbour and close family friend who provided a different perspective on the new art of photography. Sir Thomas Phillipps, the notorious bibliophile, shared with Talbot linguistic and publishing interests. Talbot's correspondents included politicians and reformers, such as Lord Henry Brougham, and influential members of society, such as Lady Jane Davy, widow of Sir Humphry Davy. Extended negotiations with Isambard Kingdom Brunel over railways pitted Talbot's land-owning nature against his enthusiastic view of progress in transportation. New York's Edward Anthony and Philadelphia's Langenheim brothers, important figures in the establishment of the American photographic industry, sought to promote Talbot's discoveries in America. Talbot's letters are also to and from those who worked closely with him. The efforts by Nicolaas Henneman, his French-trained Dutch assistant, to commercialise photography in Britain are well documented in the letters. The Rev. Calvert R. Jones, a Welsh marine painter, strove to get photography accepted in artistic circles. To these must be added scores of other lesser-known figures. Much of Henry Talbot's correspondence with his family is important. These letters provide crucial insights into emotions, conflicts, and underlying arguments not expressed in the official correspondence. Everyday human factors, such as his state of health and the vagaries of the weather, are recorded in these letters and can be seen to markedly influence Talbot's course of invention and publication. Successive generations of the Talbot family have always maintained an active and responsible interest in his archives. Indeed, in 1956, his granddaughter Miss Matilda Talbot wrote to the Times, appealing for copies of letters her grandfather had sent out. The majority of the incoming letters to Talbot is still owned by the family and is presently on deposit in the Fox Talbot Museum in Lacock (related collections from other periods are deposited at the Wiltshire Record Office). In addition to letters from influential scholars, scientists and politicians, this group also contains letters between family members and some drafts of Talbot's outgoing correspondence. Approximately 8000 items addressed to Talbot are in this family collection; in addition, there are extensive holdings of family correspondence contemporaneous with Henry Talbot. He is known to have corresponded with more than 1100 people and more than 2000 letters in his hand have been traced so far, scattered between many public and private archives. 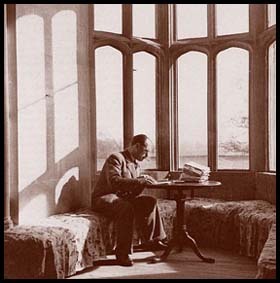 The photohistorian Harold White, examining bundles of letters at Lacock Abbey, ca. 1950, self portrait. In addition to Miss Talbot's efforts, two other people should be noted in the early history of these letters. Throughout the 1950s, the photographer Harold White struggled to provide an overview of the letters at Lacock Abbey with a view towards writing a biography (never completed).1 He worked closely with Miss Talbot to organise the letters, flattening them and recording postmarks and other envelope and address information.2 In the early 1960s, Eugene Ostroff, a curator at the Smithsonian, spent two summers at Lacock Abbey preparing the letters for microfilming.3 It is from this project that the 'LA' number associated with many of the incoming letters derived. Unknown to Ostroff, Harold White had separated the letters into two main groups, those he planned to employ in his biography, and those he labelled 'D.U.' - of doubtful use (for his own book, not necessarily in general). Col Burnett-Brown was either unaware of these, or did not consider them of value to Mr Ostroff's project, so they were not produced and therefore not included in the LA numbering or microfilming. In 1978, the late Anthony Burnett-Brown, Talbot's great-great grandson, very kindly made these letters available to Larry J Schaaf for his research, and they are now re-united with the numbered ones and held in the Fox Talbot Museum at Lacock. [see bibliography]. The present project builds on thirty years of efforts by the project director, Dr Larry J Schaaf. These include extensive tracing of archives, cataloguing of visual productions, selective transcription of Talbot's research notes and letters and the assessment of the importance of Talbot's achievements. In 1989, Schaaf was hired to catalogue the Talbot family's 1934 bequest to the Science Museum, housed at the NMPFT in Bradford. By far the largest collection of Talbot's early photographs, this archive also preserves significant scientific correspondence and Talbot's research notes. The immediate foundations of the present project were established in 1992 by a National Endowment for the Humanities (USA) grant to Schaaf. This facilitated the first computer-based calendar of the Talbot family's collection of correspondence preserved at Lacock. The calendar grew rapidly with the addition of outgoing Talbot letters held in collections worldwide. Various aspects of the project have been supported in several steps since this start. In 1993, a fellowship at the National Gallery of Canada presented the opportunity to obtain and evaluate scholarly translations of particular letters (approximately 5% of the letters are not in English). Also in that year, an NEH Special Opportunity grant permitted an emergency trip to Russia to examine an archive that had only recently surfaced (and is now once again inaccessible). In 1995, a full-year NEH Fellowship to Schaaf supported an in-depth study of some of the most complex and scientifically important letters. Beyond the immediate application to this body of letters, this fellowship permitted the development of a fuller understanding of the problems of a complete edition. A Preliminary Calendar of the letters was published in 1995 by Glasgow University [see bibliography]. The then-Principal of Glasgow University, Professor Sir Graeme Davies, created a special Professorship for Schaaf in 1999 and the British Academy funded a one-year pilot study. Based on this, the Arts and Humanities Research Board gave a three-year grant to fund the project in the years 2000-2003. Glasgow University provided additional special funding for foreign language translations. In December 2005 the British Academy provided further funding to De Montfort University to create an additional interface that enables uploading of new content and editorial changes to be carried out remotely via the Web through an access controlled account. It is now a totally web-based project, hosted by De Montfort University. One close model for the Talbot project was The Correspondence of Michael Faraday, edited by Dr. Frank A.J.L. James and published in print form. Faraday was a scientific friend of Talbot's and there are many parallels in their letters. Because of the broader scope of Talbot's interests and political connections, the notes for his letters will be somewhat more extensive than those required for Faraday. Some elements of the approach to the work of another of Talbot's contemporaries, that of The Correspondence of Charles Darwin (Cambridge University Press), have been adopted. However, this excellent work follows conventions established for literary manuscripts that are unnecessarily complex for the Talbot letters. A continuing model for the Talbot project is The Correspondence of James McNeill Whistler, based at Glasgow University. This electronically-based edition takes advantage of advanced technology to make the texts of the letters more fully searchable and cross-indexed. The decision to publish full transcriptions in electronic form was reached after careful consideration of alternatives. The nature of the collections, the potential value of the contents of the letters, and the availability of new technology informed this choice. Because of the number of surviving letters, publication of a full print edition would run to many volumes and would be prohibitively expensive. Caution on selective editions must be taken from the many selective Victorian editions of letters. Their omissions have often severely limited later scholarship, especially in the not uncommon circumstance where the original correspondence has disappeared. Any choices we make today, however well informed or liberal, are just as likely to limit scholars in the future. A 'microfilm' (film or electronic) edition would permit full publication. However, it is the least suitable approach for this particular project. Neither electronic image files or film permit searching of the text. The history of photography is a relatively young field which has yet to develop a mature literature. It is hardly known what questions need to be asked, much less what the answers might be. Of equal importance is the fact that Talbot's correspondence covers many fields and interests and no amount of indexing could anticipate the needs of all of these. Variations in handwriting styles rule out optical character recognition. The effort required to carefully read and fully index an image-based edition would approach that required for a transcription edition. No matter how thoroughly done, it would not have the utility of fully searchable text files. A third approach considered was a combination of scanned images of the letters along with full transcriptions (on a limited scale, this was successfully used by Schaaf in the print edition: Records of the Dawn of Photography; Talbot's Notebooks P & Q). The total cost of the project would rise dramatically if scans of all of the pages had to be done. However, selective scanning will be used to convey sketches or other graphics in the letters. Inserted scans may also be applied in the very few cases where there are extensive mathematical notations. In cases where words or signatures are illegible or the interpretation of them uncertain, scans may supplement the transcription. While the web-based publication will be the first realised, selective printed editions are also hoped for. This project concentrates exclusively on Henry Talbot's correspondence, both incoming and outgoing. Publications in the form of letters to editors will be included, but research notes and drafts of published papers, often intermixed with the letters, will not. These are a different resource and pose very different kinds of transcription problems (but sections of these sources that prove relevant to understanding particular letters will be included in the notes). Since the content of the correspondence ranges across a wide variety of interests, all original letters written by Talbot will be included, including letters to outsiders and to members of his family. Surviving drafts will be recorded in the notes but transcribed in full only if the original letter is missing or if the draft varies significantly from the final letter. There are some letterpress copies and a few letters have appeared in print. These will be recorded in the notes and included in transcription only where the original letter is missing. All incoming original letters addressed to Talbot will be included. However, invoices, financial reports, and "mass mailings" such as meeting announcements and sales' circulars will generally be excluded. This type of material will be incorporated in the notes where appropriate, especially where they contribute to the chronology. Correspondence between other family members can provide valuable insights into Talbot's thinking and the nature of his outside contacts. They sometimes partially make up for lacunae in Talbot's surviving letters. However, these collections are so voluminous that they would overwhelm Talbot's own letters. They will be included as needed in the notes to his letters; where appropriate, they may be quoted from extensively or even in full. More detailed summaries of the editorial policies are available - the following is a summary of the major points. The transcriptions are based on accepted principles for the editing of non-literary historical manuscripts, with the goal of making the full content of the letters readily accessible in an understandable and accurate form. The scholarly apparatus will include biographical details on the correspondents and explanations of geographical or site locations as necessary. Reference will be made to Talbot's published works, known photographs, parallel developments by other inventors, and relevant contemporary events alluded to in the letters. Where specialised or archaic terminology is likely to present a problem, links will permit the retention of Talbot's original phrasing while making the content readily accessible to researchers thinking in modern terms. Each original letter has been assigned an arbitrary but unique Document Number. When multiple letters were written on a single sheet or set of sheets of paper and posted together (to save money), each letter has been given its own Document Number and cross-referenced. Each letter (as presented on the website) is composed of two sections, a header and the transcription with its annotations. The header includes standardised personal names, dating considerations, collection information and other material derived from a database. This is followed by a verbatim transcription, preserving the names, dates and other writing in the manner that the original author employed. No attempt will be made to 'correct' the text to modern practice nor to enhance it in any way. The original spelling, punctuation and grammar will be retained and the use of 'sic'; minimised. Short abbreviations and contractions generally will not be expanded in the text (unless confusion is likely - in these cases, editorial brackets will be employed). A few of Talbot's drafts were done in his own version of shorthand and these will be presented verbatim and in full editorial expansion. The transcriptions do not attempt a type facsimile of the manuscript. However, when simple typographical devices were available to simulate the original text, they were employed: superscribing, underlining, and cancelled text appear as in the original. Some changes have been made silently. Interlineations and added text material have been inserted in the position the writer intended (and noted only in special cases). The placement and orientation of the original text on the page has not been indicated and line and page breaks have not been preserved - in nearly all cases, these merely reflected the physical constraints of the paper the letter was written on and do not add to the intellectual content of the letter. Word breaks in the original have been eliminated (and no additional hyphenation introduced). Punctuation has never be corrected; where added punctuation was deemed absolutely necessary for clarity, it was enclosed in editorial brackets. Paragraphing and indenting have been standardised as flush left. Pen rests, other accidental marks, and minor graphic devices or scribbles have not been indicated. Any obviously intentional capitals have been preserved and proper names and leading words of sentences have been capitalised. Modern annotations and markings on the letters have generally been omitted, although important ones will be preserved in the notes. Editorial interpolations are minimal and have been clearly signalled. 1For the story of White's quest, and a compilation of the manuscript text that he was able to accomplish, see Larry J Schaaf, Sun Pictures Catalogue Three: The Harold White Collection of Works by William Henry Fox Talbot (New York: Hans P Kraus, Jr, 1987). 2Sadly, however, not always correctly, and the remaining envelopes are still being re-associated with the letters. 3See Larry J Schaaf, 'The Talbot Collection: National Museum of American History', History of Photography, v. 24 n.1, Spring 2000, pp. 7-15.